Heading back to Santa Rosa soon! Counting the days until I find myself back in the Bay Area! In the last week, I hung one solo show and dropped a dozen paintings off for the Sawmill Gallery Invitational that opened on Friday evening. Both shows look fabulous. The exhibit at Blue in Portland, Maine just ended. All of the paintings for the upcoming exhibit Orbs, Science & Healing at the Bouras Gallery, Overlook Medical Center, must be framed and catalogued before I leave for California next week. No wonder I haven’t been posting on my blogs lately! In the middle of it all, a very dear friend reconnected, inspired and provided the fuel for the energy I have needed to produce and market this exciting new body of work! Life is wonderful, to say the least. Painting: Orbs No. 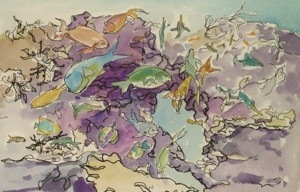 22, 22″ x 30″ watercolor with a tiny piece of handmade paper added. Since then I purchased an ipad and I’m making my own little clips. After the photo shoots in Asheville I realized I needed to become comfortable in the company of a camera. Thanks, Pete! You helped to make the giant leap into art video demos. As soon as I edit the rest of the footage I’ll post the best of what we filmed in January. The events of the last six months has transformed my life in an incredibly positive way. Thanks to a kindred spirit, Joanie Springer, an amazing artist I met through Daily Paintworks and my Creative Color Blog, I taught a couple of workshops in Santa Rosa in November when I visited my son in Mountain View. That visit realigned my brain and my heart. The amazing Weedy Seadragon ( Phyllopteryx taeniolatus) I discovered at the Academy of Science in San Francisco sealed my fate. Jumping ahead six months….. I replaced my 1988 K-car (that I loved, but needed a new catalytic converter to get through NJ inspection this month) with my first New Car!, a standard transmission (hooray!) Blue Raspberry (turquoise) Honda, FIT. I got 44.5 mpg on a recent trip to Maine. In addition to the amazing new set of wheels, I added an ipad to my collection of amazing devices. I can now make my own art videos to post online for my workshop students. Skipping the rest of the wonderful moves forward…… my father’s dementia is taking it’s toll. When my father received a Lifetime Achievement Award from Rotary last Saturday evening, I captured a video of the presentation with my ipad. While waiting for it to upload to video for my family to see, I drew and painted the above image. ( I didn’t know not to film it in Portrait……. it has taken me all day to upload the video!) It is now 5:11 pm. I realize that today’s sketchbook drawing is a self-portrait of where I am at this moment …. a really great place to be ….. and a great place to move on from. I remember the moment of hesitation, standing at the end of the diving board. Taking a deep breath before beginning my steps forward … leading to the end of the board and the leap forward into the air above the water ….. reaching me arms out into a swan dive or folding my body in half into a Jack-Knife Dive…… then entering the water and gliding through the liquid space beneath the surface. Image: Drawn first in ink with fountain pen (Noodler’s Whalerman’s Sepia) followed by watercolor using a limited palette of Raw sienna, cadmium red deep and ultramarine blue. A quick reminder…. I am teaching workshops in Santa Rosa again at the end of April! April 27th & 28th …. Riley Street Art Supply – Extraordinary and Fun Watercolor Techniques playing with Abstract Design.